Hi everyone, my Honda 928 needs adjustment. Usually when you hold the left drive lever down then hold the right auger lever down it will stay down and you can then use your right hand to operate the speed lever. However, recently my auger lever won't stay down on its own and needs a bit of adjustment. Unfortunately I don't know what needs tightening. Do you? Thanks for your assistance! The auger (right side) lever can be held down by the drive clutch (left) lever. There's a shaft that connects the two of them, and a cam lock boss and spring that makes the mechanical connection. If the auger lever isn't staying put, start by inspecting the linkage, and pay close attention to the cam lock boss. Make sure nothing is binding or stiff, and is properly lubricated with a light touch of general-purpose grease where indicated. Be sure the return spring is in place, as well as the washers, cotter pin, and the small ratchet hardware is okay. Inspect the bushings near the cam lock boss for wear or slop, and be sure all hardware is properly tightened. Caveat: I work for Honda, but the preceding is my opinion alone. Thank you both for your replies and instructions! You're what makes the Internet an invaluable tool for everyone! Thank you very much for posting this. I had the exact same issue yesterday with our 30" of snow. 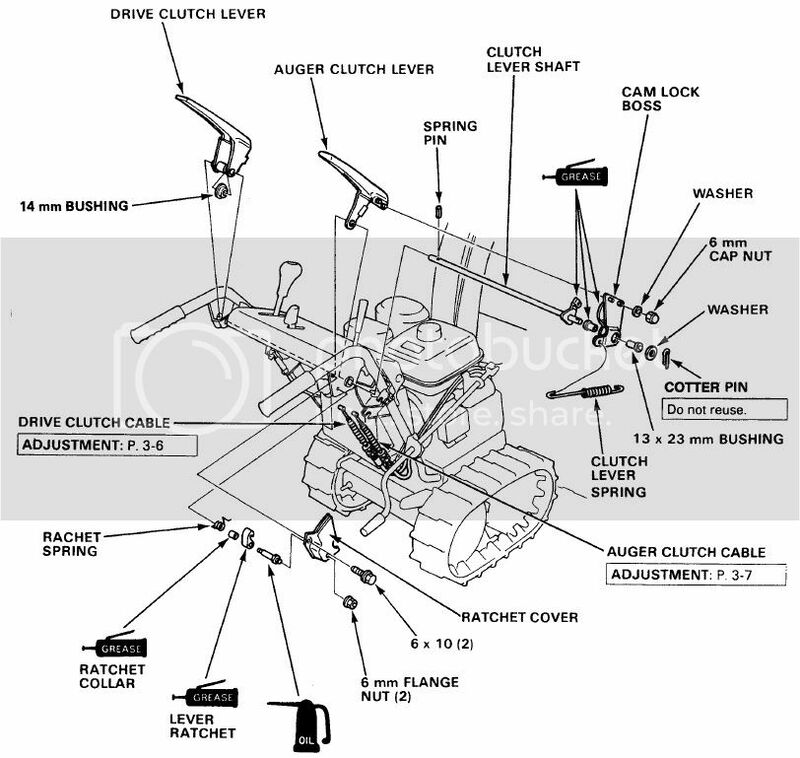 The auger clutch lever would not stay engaged with the drive lever engaged. I will tend to this later this week when I have time. I have another (most likely related) question. My unit is a wheeled HS928 from 1999 (I bought it brand new as a left-over in 2000). I am truly amazed by this piece of machinery. In the 15 years I have had this (with no exaggeration) it has started on the first compression stroke EVERY season. I add a few drops of oil in the cylinder and STABIL in the fuel before I put it away for the summer. Anyway, last year I had an issue with the auger lever not DISENGAGING when released. It felt like stiction, or a binding cable perhaps. I examined it as best I could and lubed the questionable points but to no avail. This is a safety issue, as when I release the auger lever, it stays engaged for quite some time until vibration eventually causes it to release. The only way I could find to alleviate the issue was to remove the (auger clutch lever spring as pictured above.). I know this is only a band-aid fix, and was hoping for a more permanent solution. Could the two issues be related, and I just need to disassemble the levers and shafts, give them a good cleaning and lube? I had the same issue on Tuesday. My machine is a 724 and it took 5 mins to rectify. I just removed the ratchet cover, bolt, lever, collar and spring. Sprayed all those parts liberally with brake cleaner then applied Fluid Film to the parts and reassembled. Problem solved. First, for safety reasons, you should not use the machine until the auger-not-stopping issued is resolved. Next, it could be a simple fix, like cleaning and lubricating the lever/linkage, inspecting the cable for binding, rust, damage, etc. Going deeper, the auger engagement is done by a tension roller that tightens a belt that drives the auger gearbox. There are four springs, and an a rather complex system of pivots, rollers, and a brake system that are used to start (and fully stop) the auger. Failure, wear, rust, grease, etc. of/on one or more of these parts might cause the auger to not stop quickly when the lever is released. A complete inspection of the auger engagement lever and possibly the tensioner/brake is needed to really find the true cause. Due to the safety aspect of this problem, I'd really encourage you to have a Honda dealer go over it and do a proper diagnosis. Thanks for the reply. Yes, I realize the safety issue here. I am VERY safety conscious. I want to note though, that with the the spring removed as mentioned above, upon releasing the lever, the auger DOES stop in less than two revolutions. I realize this is a temporary fix until I can find the issue and put the return spring back on. Though i will say, even since new, I have never noticed any kind of direct braking of the auger when releasing the lever. Are you saying that there is a definite auger brake system that stops the auger instantly when the lever is released? If so, I don't think I EVER had that on my machine. But I could be wrong. I have been down in the area of the auger engagement pulley & belt before. I had to replace a drive belt and I was looking for the source of the auger lever binding as well. It was a while ago, so I don't exactly remember what it looks like. I don't remember seeing very much down there, maybe ONE spring. certainly not 4. I do remember seeing the engagement pulley and the "swing lever" it is mounted on, it appeared to be "free and not binding" when I moved it manually. The auger lever itself also appears (by feel) to be free of binding. Maybe it *IS* the cable, though the accordion seals appear to be intact. Can you elaborate on the multiple spring system a bit for me? Maybe a diagram or picture? Thanks again for taking the time to reply. and I found the 2 tension roller springs on the handlebar diagram and the other two on the Tensioner Arm diagram. The bottom two are called returns. Another great site is YouTube and DonyBoy73. He has a lot of videos that I have found VERY helpful! wwjd1332, Tnx for the links to the pictures. Very helpful . In order to be able to post messages on the Snowblower Forum : Snow Blower Forums forums, you must first register.